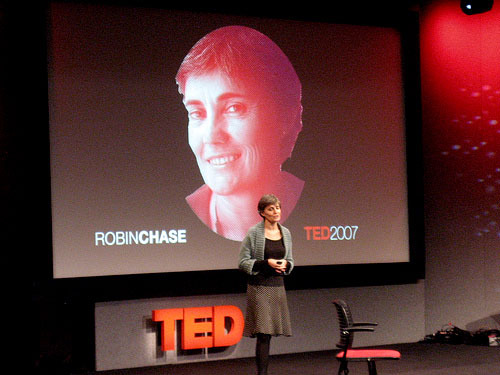 Robin Chase at TED 2007. Photo by PMO on flickr. Robin Chase, founder and former CEO of Zipcar, joins thecityfix.com as a regular contributor. Robin will be cross posting select items from her personal blog, Network Musings, where she’s been writing on the world of sustainable transportation. Robin Chase is founder and CEO of GoLoco, an online ridesharing community. GoLoco helps people quickly arrange to share car trips of all lengths between trusted friends, neighbors, and colleagues, and handles online payments from passengers to drivers for their share of the trip costs. GoLoco’s innovative combination of social networks and online payment systems recasts how we think about car travel, making it a time for socializing and with a new emphasis on trip efficiency, in order to reduce per passenger costs. Robin is also founder and former CEO of Zipcar, the largest carsharing company in the world. Zipcar’s use of the Internet and wireless technology enables rental cars to emulate personal cars. Zipcar’s disruptive technology gives its members on-demand access to cars by-the-hour, revolutionizing people’s relationship to their cars and improving the quality of urban life for all. Robin is frequently consulted by transportation and planning departments, city and state government agencies, and NGOs about wireless and mesh networking applications in the transportation sector, innovation and economic development. She served on the Boston Mayor’s Wireless Task Force, and the Governor-elect’s Transportation Transition Working Committee. Robin lectures widely and has been frequently featured in the major media including the Today Show, The New York Times, National Public Radio, Fast Company, Wired, and Time magazines, as well as several books on entrepreneurship. She has received many awards, including the Massachusetts Governor’s Award for Entrepreneurial Spirit, Start-up Woman of the Year, Fast Company’s Fast 50 Champions of Innovation, technology and innovation awards from Fortune, CIO, and Info World Magazines, and numerous environmental awards from national, state, and local governments and organizations. Robin graduated from Wellesley College and MIT’s Sloan School of Management, and was a Harvard University Loeb Fellow. She lives in Cambridge, Massachusetts, with her husband and three children.